Last week was all about ME. ME is over-achieving OCD fanatic at her finest. ME cleans and cleans and cleans, and still finds more that needs to be cleaned. ME does at least one load of laundry every day. ME exercises like a good little girl. And ME actually loves doing all this stuff, and finds great joy in it. This week, BIZARRO ME has taken over. BIZARRO ME sits in her pajamas until 11 every morning. BIZARRO ME will exercise later . . . and later could be in an hour, in a few hours, tonight while watching TV, or next week. BIZARRO ME has decided since so much cleaning got done last week, the house really doesn't need much cleaning this week (besides a swipe of the kitchen counters and a good vacuuming every couple of days). BIZARRO ME spends hours playing computer Mah Jong. BIZARRO ME can go out and get some Christmas presents bought. (Don't click the link, Sweetpea) Oh but BIZARRO ME sure has a lot of fun, and has decided this week is "vacation week!! BIZARRO ME is not all bad, because a lot of knitting sure gets done. Look, progress on Pea's secret Christmas present. 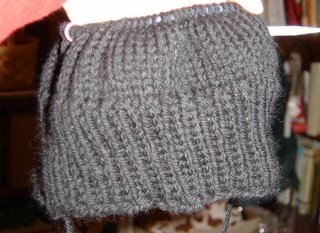 And look, it's a hat, coming along pretty quickly as well. I'm worried about the wonky edge (which is worse in the picture than in real life), but hoping some blocking will help. And today Wool-Ease was purchased for slippers for my brother . . . my tall tall brother with the size 12feet (maybe I should have bought three skeins). Okay, all this talking about myself in the third person (not to mention as if I have a split personality) has sufficiently freaked me out. I'm going to knit some more. I should walk on the treadmill, but I'll do it "later". i miss being in school precisely because of winter/spring/summer vacation when i have the option of doing stuff "later". I was just mentioning to my hairdresser yesterday that I think it's healthy to have multiple personalities. No, I don't mean like having one that kills people, but for instance take me: sometimes I love to go clubbing and just be a wild crazy gal, but then the very next day I will bake, clean and knit all day long (and nurse the hangover). See, perfectly normal. Ha ha, well maybe using me as an example for normal isn't as accurate as I thought. Anyway, enjoy this time. You are the boss of you, don't forget, so don't feel bad for letting your body take the time it wants to rejuvenate itself. Maybe you need to get a stationary bike for Christmas, ha. Oh boy. And I'm a Gemini, too. Yay us! George likes his Kung Pao spicy! Do I watch too much tv?